May 2-7, 2017. 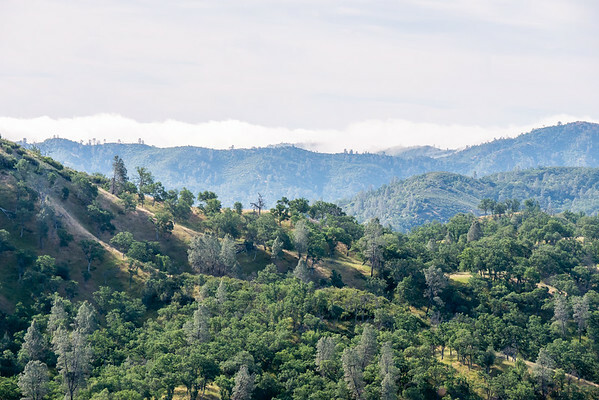 California Coast Range. 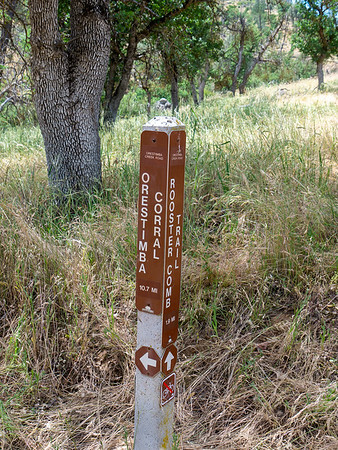 A long loop from the Park Headquarters to the far northeastern reaches of the park including the Orestimba Wilderness and the Upper San Antionio Valley. This gallery covers the last three days (May 5, 6, and 7) and the trip back starting from the upper Red Creek area: Robinson Creek, Orestimba Creek and Rooster Comb Trails, a night at Paradise Flat with a short dayhike the next mooring to Paradise Lake, Orestimba Creek and various up-and-down trails to a camp on upper Pacheco Creek just above Pacheco Camp, then out via Hoover Lake, Willow Ridge, Los Cruzeros, and Poverty Flat. Some of the places farthest back I last saw in 1985. The Robinson Creek and Hoover Lake areas were new to me. Previous gallery. Friday, May 5. Climbing out of the Red Creek valley on the Robertson Creek Trail. The peak ahead is the otherwise unnamed "Cone 2747'. I'm headed to the ridge just ahead. 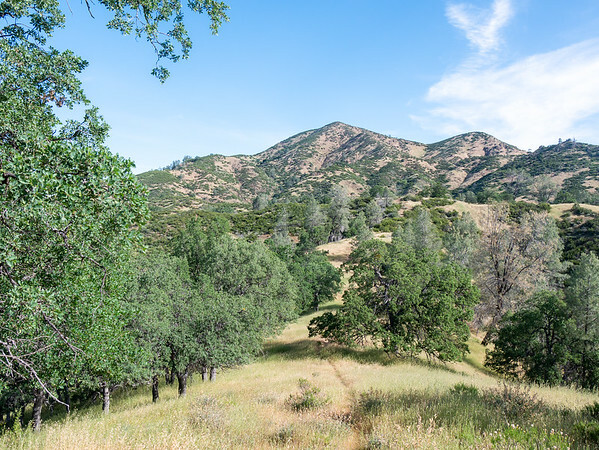 The trail turns right, runs along it, then drops to Robinson Creek. To the south and west there's a fog/cloud bank spilling over the hills. While it's a bit cooler now than the last few days, it's still warm. 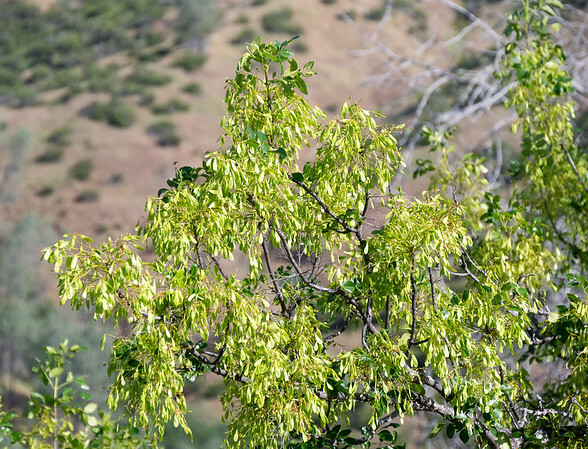 Fraxinus dipetala (California ash). 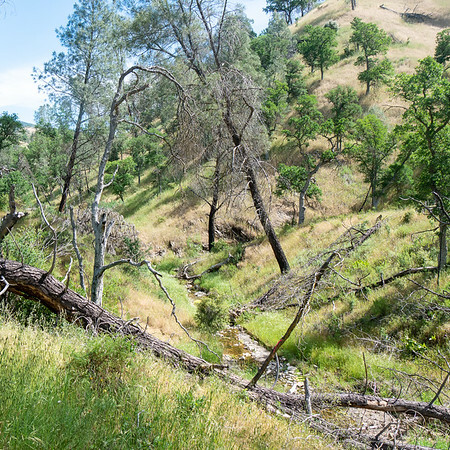 I'm on the ridge dividing the Red Creek and Robinson Creek drainages. 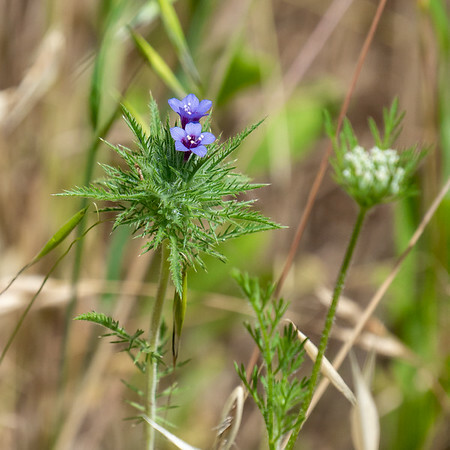 Unlike those I saw on the Coast Ridge Road, these are mostly in seed. 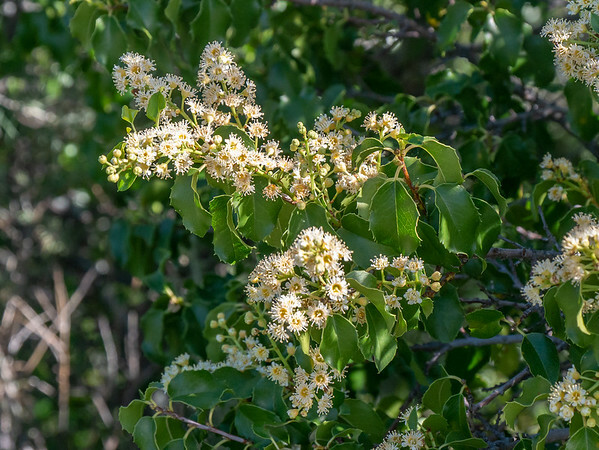 Prunus ilicifolia (holly-leaved cherry) also on the ridge dividing Red Creek from Robinson Creek. 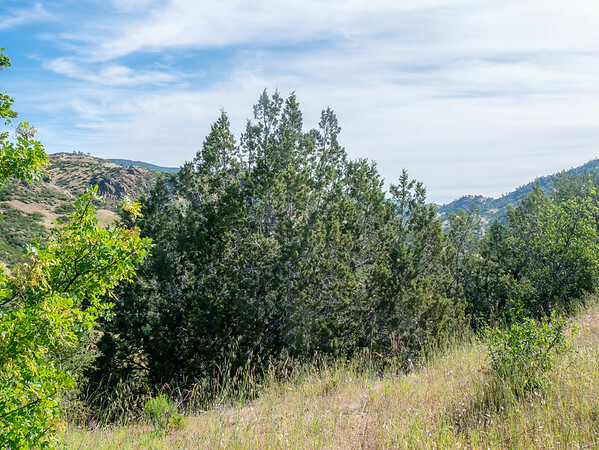 Juniperus californica (California juniper) on that same ridge. This is quite large, maybe 15 or 20' high. 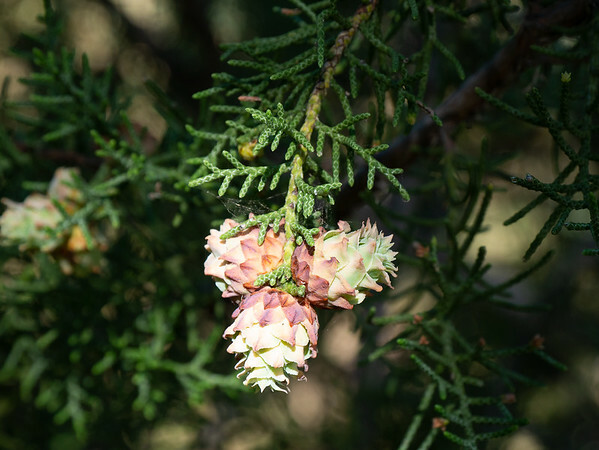 Juniperus californica (California juniper), but a different plant than before and on the shady drop toward Robinson Creek. I think these are female flowers or very early forming fruit. I gather the scales grow and fold together to produce the characteristic berry. Still, these seemed awfully big. 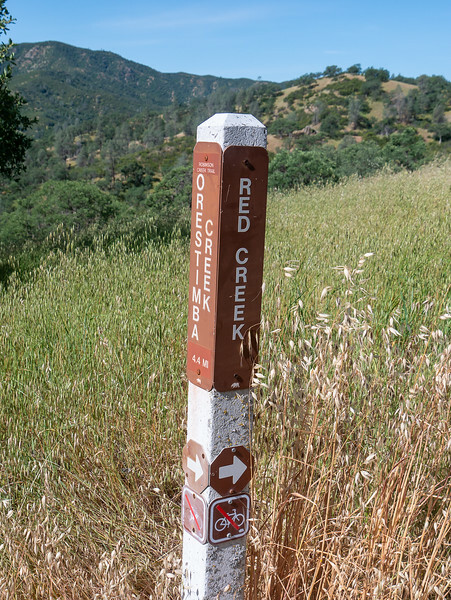 There's a marker up where the trail turns off the ridge and down toward Robinson Creek. But there is no other trail, so I guess this is just to flag the turn. Heading down. This is an old road cut, one that today clearly doesn't see that much use. 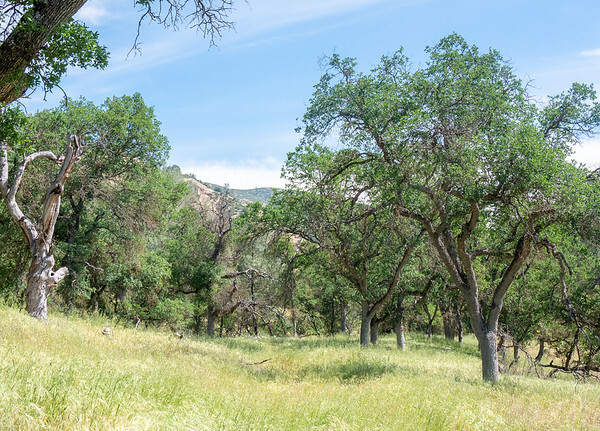 For the most part, the walk along Robinson Creek was through open grassland with scattered pines and oaks, a few deadfalls, and not always much tread. Robinson Creek had water, but it's not a large stream. It may be dry soon. 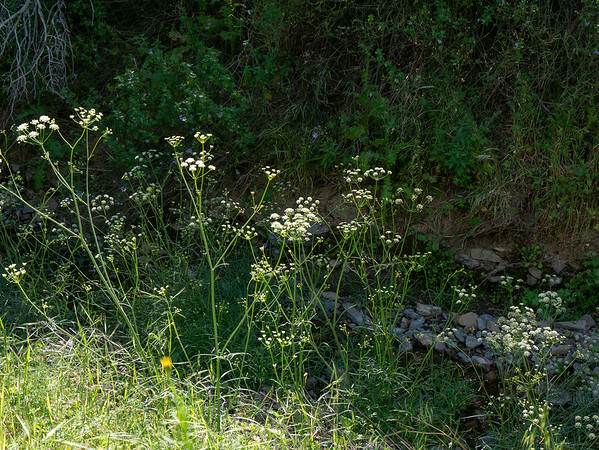 Perideridia californica (California yampah) along Robinson Creek. That's the trail. See the roadbed? As I went on it got more open and more brown. 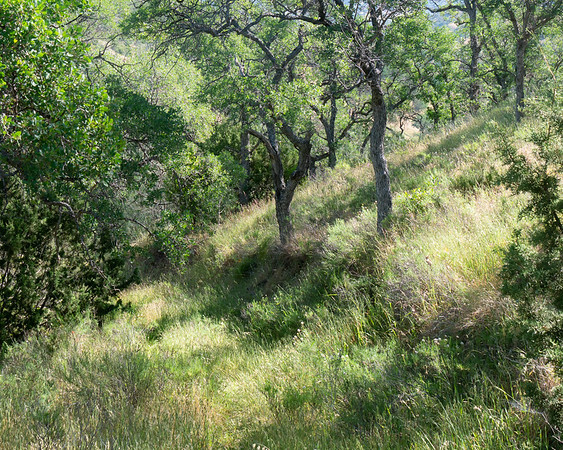 Some of the dry, foxtail-laden grass reminded me of the trek down the Sisquoc last year in the San Rafael Wilderness. But the grass here was shorter and I only had about two miles of this stuff (not 20). 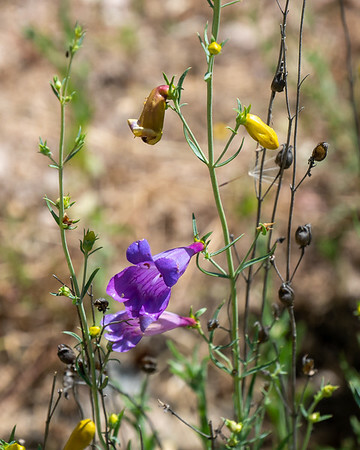 Penstemon heterophyllus (foothill penstemon). Interesting how the buds on these are so yellow. 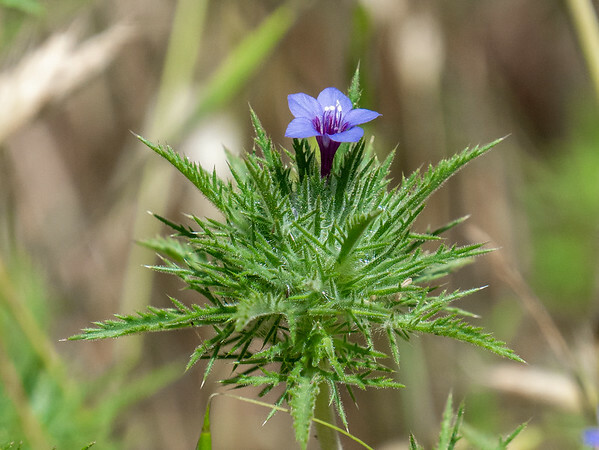 Bloomeria crocea (common goldenstar). I only saw this one, and it's horribly ragged. 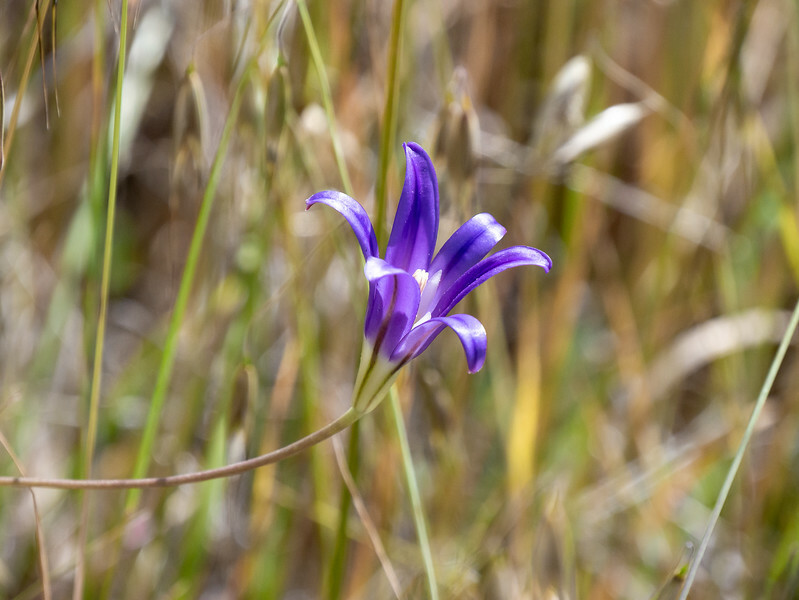 In the field, I though this was an odd, old Triteleia ixioides, since the umbel, size, and yellow color fit ... but not the flower shape. Finally down to the Orestimba Road. I know I was getting tired: there was a great old sign to various ranches ... and I shot this instead. Navarretia pubescens (downy pincushion plant). 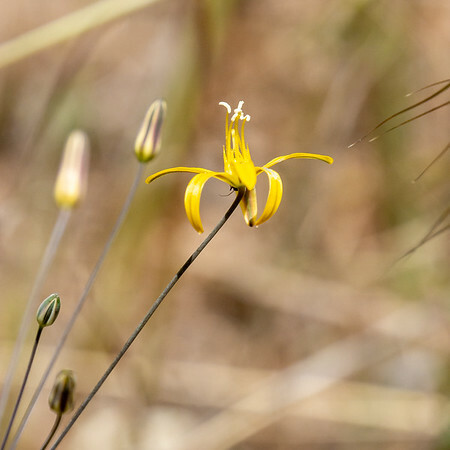 The Pine Ridge Association list has only N. squarrosa, but that has included stamens. Navarretia pubescens (downy pincushion plant). Very good look at the tube here. 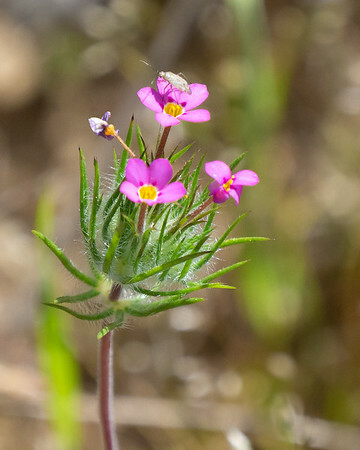 Leptosiphon ciliatus (whisker brush). L. bicolor is a possible but it typically has one flower open at a time. The fuzz below and the red dot on the petals also point to L. ciliatus. 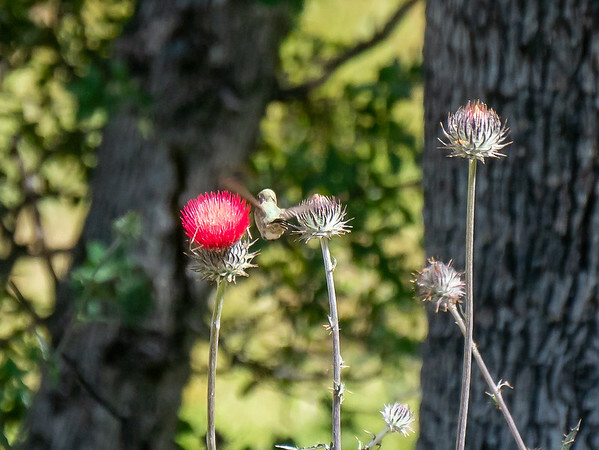 Cirsium occidentale (cobweb thistle) with a well-placed hummingbird. Even 1/800 second shutter is a little slow for a hummingbird ... and he didn't stick around long enough for me to adjust things. Shortly before I got to the top of the climb from Poverty Flat to the ridge, I found, on the road in front of me, this marvelous display of turkey masculinity. Note the dragging noises one of the toms makes with his feathers ... and, at one point, the indifferent hens. Nice way to end a trip.